"Go Sox" rolls off the tongue. It's not so easy to make a 52-story building talk. But that's what about two dozen building engineers working for Boston Properties Inc. did yesterday between 4 and 7 p.m., getting the Prudential Tower in uniform for the kickoff of the Sox-Rockies World Series clash at Fenway Park. The west elevation of the city's second tallest skyscraper, visible from Fenway Park, will say GO SOX in large white letters. "It doesn't go on like a switch," said Mark S. Cozzens, regional property manager for the owners of the Prudential Center. "They do a computer program that is a picture of the face of the Pru and has the position of all the windows." Then the process becomes low-tech. Engineers literally go from floor to floor, making sure certain window blinds are closed in the right direction, blocking out stray interior light shining outward, turning on lights on 18 floors (9 above for GO, 9 below for SOX), adding fluorescent lights where interior bulbs aren't bright enough, and overriding energy-saving devices that would otherwise darken a letter, and dampen the indomitable Red Sox spirit. "We did it in '04," said Cozzens, referring to the Sox Series victory, after being shut out for 86 years. "We did it '86 as well, though with not as much luck." Cozzens said there are no known Colorado Rockies fans among employees in firms working on strategically located Pru floors. Some Pru tenants going to the game even have bragging rights. "They say, 'See the G? That's my office,' " said Cozzens. And the Pru isn't the only large structure that's got the fever in Boston. As thousands of drivers in traffic on the Southeast Expressway can attest, the Corita Kent artwork on National Grid's gas tank near Morrissey Boulevard recently has had some competition. 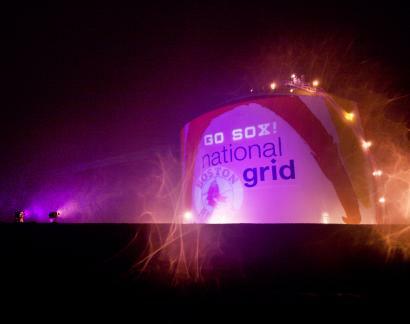 National Grid, formerly KeySpan, is projecting messages onto the side of the gargantuan structure. National Grid started early with slogans and logos during the series with the Los Angeles Angels, continuing through the Cleveland Indians games. Starting the Series last night, the tank shouted, "Red Sock the Rockies" and "No Rockies High Here. Go Red Sox."